I know I have said it before, but I am a product junkie. 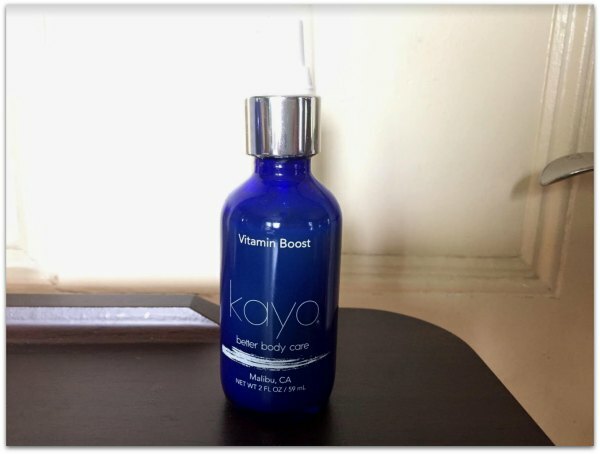 It was exciting to get a package from Kayo Better Body Care for review on my blog. Kayo believes in protecting, enhancing, and rejuvenating the other 95% of your skin, rather than just the 5% on your face. I have a few friends that are estheticians and putting body products on your face is a huge no-no. Then I thought to myself, “Well, why not? Are there no quality products made for our bodies?” After all our skin is our body’s largest organ, we should take care of it as well as we do our face. Kayo is designed with face grade active ingredients to protect, enhance and rejuvenate 100% of your skin, not just the 5% on your face. 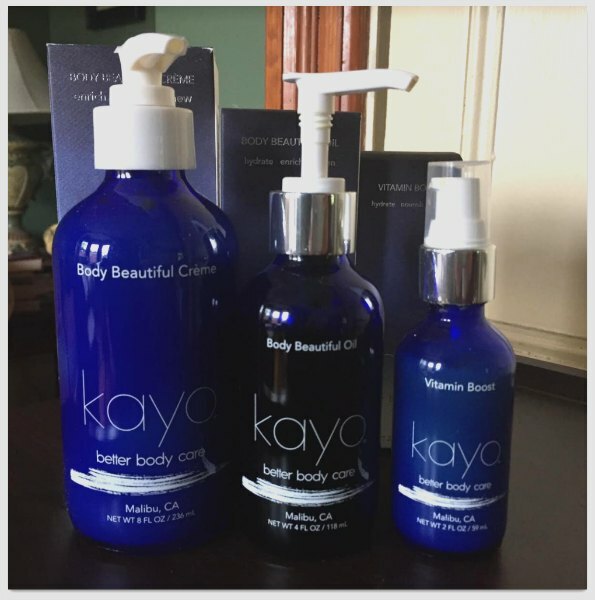 Kayo delivers exactly what the skin on the rest of the body needs and provides the resources needed to fortify your body the way you do your face. Let just start by saying that I love the products I was sent and plan on buying a few more to compliment the collection. The slight fragrance reminds me of being at a spa. The best part is that I get to experience that feeling every day. My skin is dry, so dry that I have been known to scratch myself until I bleed. 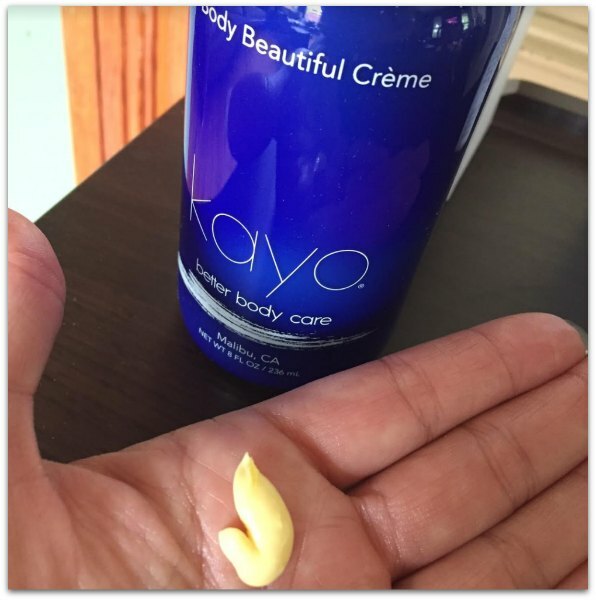 I have been using Kayo face grade body care for about 2 weeks now and my skin has never been softer or smoother. Above is a photo of the body creme, it is rich, but not thick enough to be considered heavy. The 8 ounce comes in a glass bottle with a pump. It is beautiful and luxurious. The Vitamin Boost also comes in a glass container with a pump. This product is so good that it can be applied to the face as well as the body. Just 3-5 pumps can be massaged onto clean dry skin for spot treatment of dull and stressed skin areas. It can also be mixed with the Beautiful Body Creme or Oil. That is how I have been using it. Vitamin Boost is a lightweight formula used to help brighten, hydrate, and rejuvenate skin. I give this product a big A plus! Unlike the Creme, barely any scent can be detected with this product. On a side note, these products are made in the USA and do contain nuts or nut by-products. People with nut allergies should avoid these products. The other product I sampled is the Body Beautiful Oil. This also comes with a pump in a glass container. I’m not a big fan of this in a pump. The oil comes out too quickly until you can master it. I have just about the right squeeze down to get the amount I need without wasting any. This is a pricier product and I would not want to waste a drop. 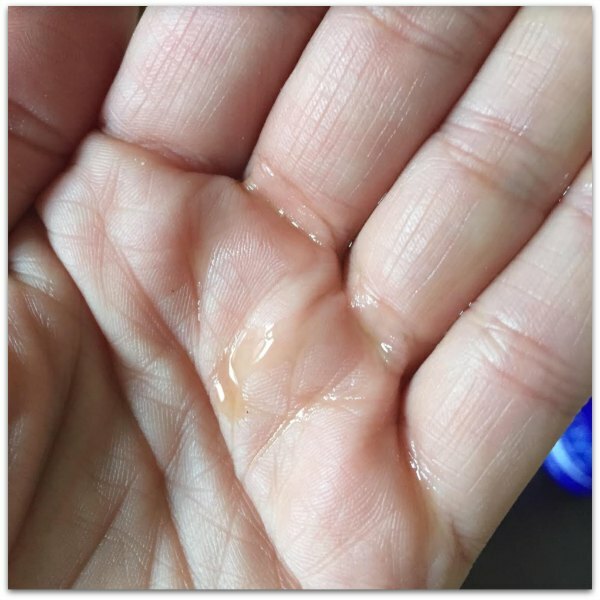 Also the glass container needs to be handled carefully after you have some oil on your hands. That all being said, I love the oil!!!! As I said up top I have never had such smooth skin, I’m sold. The products are Vegan and never tested on animals. Products are free of Parabens, Sulfates, Phthalates, Petrolatum, Synthetic Color, PEGs, TEA, DEA, GMO’s and Mineral Oil. Don’t let the price stop you from investing in this product and having great skin! You do get what you pay for and this is quality spa product in your own home. 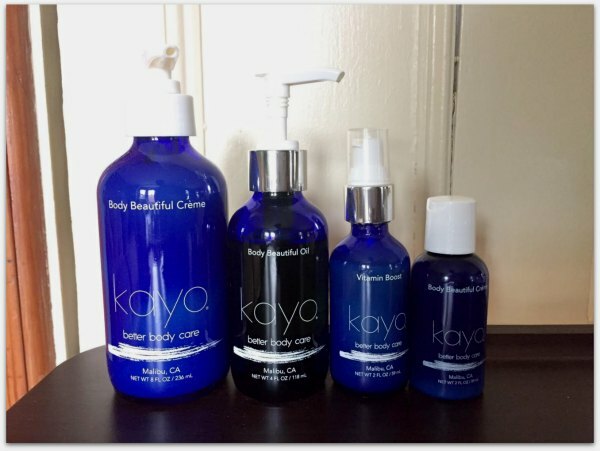 Visit Kayo Better Body Care to purchase and for more information. Use the code MILENAB15 to receive 15% off your first order at Kayo! Disclosure: I was sent product in exchange for a review. All thoughts belong to me and have not been influenced. Wait a minute… it looks like your only using a dime of your products? I use way more than that with what I have now. Totally need to try this stuff! I would try the vitamin boost. I think our skin needs extra loving and like you said price shouldn’t stop us from taking care of ourselves. 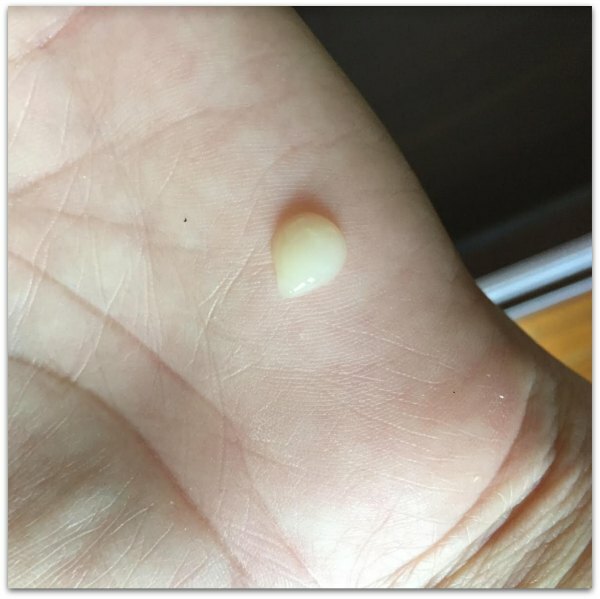 It looks like great moisturizer which doesn’t require using a lot at a time. I like a good thick cream, especially for my hands and arms. I have to say, the bottles are so pretty too! Love that blue! Wow! These sound fantastic. I always struggle with finding great products but I’m going to give these a try right away! I love the packaging! I especially like that the vitamin boost can be used on the face and body. This sounds like a pretty good product line. I love that it works head to toe. It looks creamy, too. A few of my friends have raving about Kayo for the longest. I haven’t tried these out yet, but I love how it focuses on rejuvenating your whole body and not just the face! Wow! This is great! I love that so little goes a long way. I’ll have to try Kayo out! Thanks. Ohhh I’m always game for trying a new face or body oil. I’ve found them to be so effective! This review is really nice. I love to try the products.